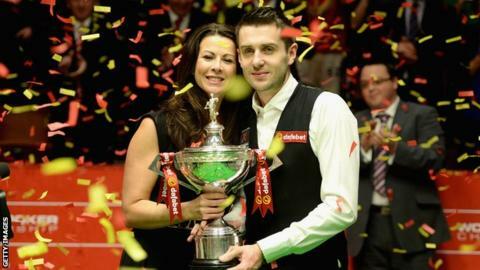 Mark Selby dedicated his maiden world title to late father David, who died of cancer in 1999. The Leicester-based player, 30, beat defending champion Ronnie O'Sullivan 18-14 to become new world number one. "My father died when I was 16, two months before I turned professional, and his last words were, 'I want you to become world champion'," said Selby, who overturned a 10-5 deficit to win. "I said to him, 'I will do one day'. Thankfully, today it's come true." Selby, who trailed 10-7 overnight, triumphed on a dramatic final day at the Crucible and later admitted his exhaustion following a gruelling semi-final victory over Neil Robertson. "Every time I got a chance, I felt like I was capable of scoring, but on Sunday I was missing balls because of tiredness," he said. "But towards the end, when Ronnie came back to 15-14 and asked me the question, I probably played my best snooker of the final in those last three frames. I needed to attack him and I did." "To beat Ronnie in the final to win my first world title is a dream come true." Selby turned the match around by winning the first four frames of day two. "Ronnie's one of the best front-runners in the world and I wasn't playing well at all at 8-3 down," said Selby. "But, a couple of times, he missed and I kept digging in and nicking frames. "That Selby found a way of stemming O'Sullivan's natural, free-flowing game should be applauded. Selby's was matchplay snooker at its brutal best. Not pretty, but snooker at the highest level has never been a potting contest. "This year's final was also far more compelling fare than the previous two editions, both of which O'Sullivan won with plenty to spare. O'Sullivan processions are fun, but they do not reflect well on the overall health of snooker." "To get out 10-7 on Sunday, it felt like I was winning 10-7. I was physically and mentally tired on Sunday, but Ronnie outplayed me and I was still only 10-7 behind and I hadn't really turned up. "I thought if I had a good night's sleep and won the first session 3-1, I'm back in the game. I managed to win the session 4-0." Five-time champion O'Sullivan paid tribute to Selby's tenacity after losing at the Crucible for the first time since 2011 and the first time in a final. "I tried my hardest but he was just too good," O'Sullivan said. "I've had some great victories here but losing is part of the sport. I'll go away, lick my wounds and come back and try to be one better next time. "It wasn't the most free-flowing game - there were a lot of long safety bouts and I got dragged into it. "I tried to make something happen and open balls up, but when you're forcing something to happen it never quite happens. Everything I did, he had an answer for - and more."